Urban/Local: A Cheese SpeakEasy. November 8th. It is with great pleasure that I announce a collaboration between fellow Brooklyn based cheese maker, Matt Spiegler, and I, in one incredible cheese soirée. The evening will be an eclectic mix of urban and locally made cheeses, beer from Basil Lee and Kevin Stafford of Finback Brewery (Queens’ newest craft brewers), a screening of a new short cheese making film that I have been working on during the last few months, and more! This is the perfect way to learn about one of your favorite food groups….cheese! The event will be held at Skytown, a bar and café in Bushwick. Matt Spiegler writes the well read blog, Cheese Notes, which spans the horizons of everything cheese related. His close ties with the local and international craft cheese culture make him a great resource! 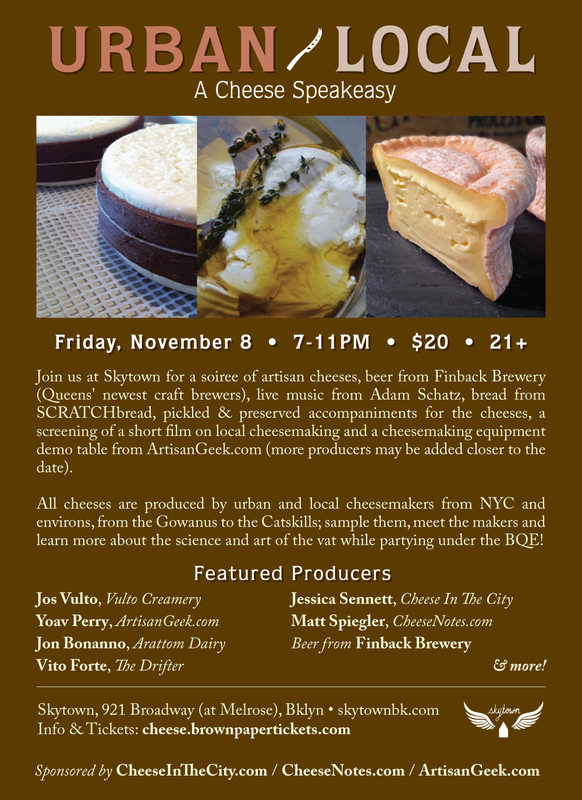 Cheesemakers at URBAN/LOCAL will include Jos Vulto of Vulto Creamery, Yoav Perry of ArtisanGeek.com, Jon Bonanno of Arattom Dairy, Vito Forte of the Drifter, as well as Matt and I. The variety will be spectacular, the pairings will engage your senses, and the music will elevate your mood. The final lineup of participants could change as we get closer as well, so stay tuned here and at Matt’s blog for updates! You can read more about some of the participants in the “urban cheesemaking” post Matt wrote for Modern Farmer.